Hi forum, I was sent photos of this old mysterious thing that was found in a scrap yard in Bulgaria (Eastern Europe). The thing looks heavy and massive and has something like a side car going on, or maybe it is a trike, I can't tell from the photos. It looks to have a cast front wheel, like a Böhmerland. It would take a braver person than me to take that one on. Other than the rusted-through fork shroud it all looks solid enough to me. Obviously every bearing etc is going to be shot, but a blasting and new paint would see that looking much better. Looks like it's got the standard Commie-crap rubber saddle to presumably post-war? Most pre-war German bikes come with a similar rubber saddle. With that said, I have never seen a German bike that looked like this. The frame is way too massive, the tubing is too thick, the cast wheel on the front adds to the overall heavy look of the thing. I browsed the whole internet looking for something similar, but could not find anything close to it. Distant half ancestor to the Kettenrad ? if you take away those half tracks. Maybe the machinegun or artillery piece that was mounted on it is still there, somewhere ? Have you/ can you have a close study of that differential. then that puts it into a different ball park. Otherwise, maybe "The monstrosity from Bulgaria" isn't so inappropriate ? Machine gun or artillery piece? Hmmm...I was thinking more potato delivery or somesuch mundane use. Shame it wasn't a Kettenkrad as they fetch big money now. I don't know if I can gain access to the differential. The scrap yard is away from me. But it could totally be a type of German war machine as well. Some weird trike thing that carries guns and personnel. I think I found out what this is. It has to be some prototype of the FN Herstal tricar, which was used by the German Wehrmacht during WW2. Extremely rare with only 7 in existence, so pretty much useless for restoration. But "our" bike has teleforks on it, and the Wehrmacht bike has girders, and the wheel's different too. Try searching for Italian efforts. It's not exactly the same, this is why I think it is a FN prototype of some sort. I searched high and low for all sorts of classic tricars and the FN is the closest thing I could find. There is nothing like the thing from my pictures on the whole internet. If it is not a FN, then it must be something even more wicked. It's a very interesting beastie, but nothing (I think) to do with FN. 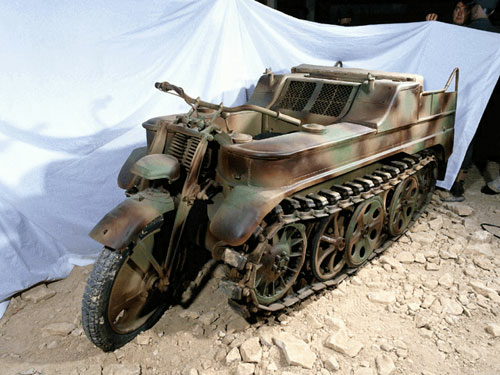 The M12 motorcycle was made with a driven-wheel sidecar 1937-1940, and the Model 12 T3 Tricar was developed along-side, and built in reasonably large numbers. In the FN Tricar, the front wheel is at the centre of the triangle, and the rear differential was offset to the right, and the chassis detail is quite different. I have a book about FN with an extensive chapter on its military machines, and there is nothing to resemble the "monstrosity". The "monstrosity" is neither "driven sidecar", nor "conventional tricar" - the front wheel is neither in line with one of the back wheels, nor equally-spaced between the rear wheels. This should be an id feature, as should the braced telescopic fork. It's such a weird thing it's hard to even guess the date, but I suppose somewhere between 1938 and 1960? I bet some people would love to put a BMW or Ural engine in that! I wonder what the original engine was. Apparently, it used a cardan shaft and must have been above 750 cc, so I am thinking a boxer. Anyway, it looks like it will be really hard to ID these leftovers. And it's impossible to restore something that you know nothing about.